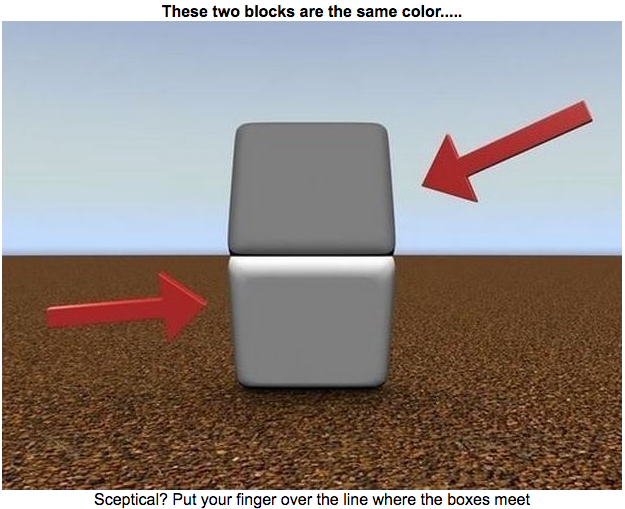 These blocks are actually the same shade of gray, but the top one appears to be dark gray in the light and the bottom appears to be white in the shadow. But if you put your finger over the part where they connect, you’ll see that they are in fact the exact same color. When you take your finger away however, they once again appear to be different. It’s like that with emotions too — they always appear to be automatic and out of our control. But in fact they are not, hence the illusion. You can’t change emotions directly however. Experiment with this yourself: think about something that makes you a little bit anxious, then stop feeling that way. Can’t do it. But what you can do is change how you are thinking. That’s super duper easy. And when you do, you feel differently automatically as a result. In fact emotions have two components: a physical component and a cognitive one. You can change the physical component by taking drugs, sleeping, eating something, doing breathing exercises, tossing a ball back and forth between your hands, going for a run, doing yoga, engaging peripheral vision, changing posture, etc. You can change the cognitive component by focusing on something else (distracting), putting things into a larger frame (reframing), changing what you are thinking about (content), changing how you are thinking about it (submodalities), etc. Modalities are our 5 senses: visual, auditory, kinesthetic, olfactory, gustatory. But we tend to think in terms of visual and auditory, making inner pictures and mental movies, and having imaginary or remembered conversations with ourselves and others. Sub-modalities are aspects of modalities, such as distance, size, brightness, color vs. b&w, perceptual position, and so on in the visual modality. Auditory submodalities include things like volume, pitch, tonality, location, speed, and so on. Making changes to these sub-modalities instantly and reliably changes how we feel. Then with a little practice, we can’t get it back the old way. You can try this out by imagining seeing a roller coaster at a distance, watching people get on and watching it go up to the top and come down a steep hill. Kinda boring. Then imagine getting on a roller coaster, waiting in line, getting into your seat, strapping in, feeling your back against the seat as you go up, seeing the people on the ground getting smaller and smaller, hearing the “clack clack clack” as you go higher and higher, and then feeling the rush as you fly down the hill. Same content, different perceptual position. That makes it a very different experience. By figuring out how we are thinking about something that is making us feel needlessly anxious, we can easily change the submodalities and thus have a very different response. I’ll be teaching a one-hour class on this very topic at the 2018 ICBCH Virtual Hypnosis Convention Feb 24-25. The entire cost of the convention is less than I would charge for my 1-hour video at only $27. You can sign up here if you are interested (you don’t have to be a hypnotist to enjoy these presentations). Or if you know someone who is suffering from needless anxiety and stress and wants to completely resolve this in 2018, get in touch. I’ve been developing a robust curriculum for transforming anxiety into calm and courage and would love to help. My coaching site is currently still at duffmcduffee.com.